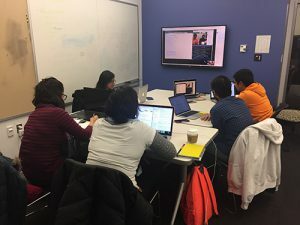 The User Experience and Interaction Design graduate students at Jefferson University are currently partnering with the W3C community to redesign the W3C specifications found at https://www.w3.org/TR/. We need you — the people who use those specifications to participate in this process. The W3C Specification Redesign Team comprises students in the User Experience and Interaction Design master’s degree program at Jefferson University. They interviewed Elika Etemad on Jan. 19, 2018. In Fall 2017, the User Experience and Interaction Design program at Jefferson University was invited to participate in a project with the World Wide Web Consortium (the W3C). This term, we’ve established a class and a small working group to provide visual design or CSS recommendations for the W3C’s specification pages. We, the members of this working group at Jefferson University, want to do our part to make the web more accessible and the standards for that web easier to use. Our team consists of students who are passionate about user experience and know that user-centered design relies upon the participation of people like you. Our point of contact is former Jefferson student Elika Etemad. Etemad is an invited expert for the W3C CSS working group and a point person for the /TR specification design project. She has graciously given us the required information to create our schedule for this project. Our goal is to redefine the visual appearance, improve the visual hierarchy and enrich the experience of the specifications. We hope that after the visual treatment, users will find it easy to use and find necessary information. Our first objective: To understand how people use the specifications. Tell us how you use the specifications by taking our survey. If you’re interested, we’ll follow up with an interview. To get started, please take this quick survey.